The growing influence and power of sport has seen Warren Alcock inhabit the List for a couple of years, albeit down slightly as a result of increased numbers within the list. A native of Napier, he graduated from Otago Law Schoolwith a first class honours degree together with a BA in economics. Before leaving the faculty he also spent time teaching and as assistant lecturer, initially as a Maori Land Law lecturer. He then moved to Dunedin’s Gallaway Haggitt Sinclair (now Gallaway Cook Allan) where he worked for 14 years where he worked as a litigator. Among his clients were Otago and All Black players and he developed his sports law practice to the point where he joined fellow Otago law school graduate Bart Campbell and Lou Thompson in setting up Global Sports Management, specialising in rugby in New Zealand, Japan and the United Kingdom. GSM is now part of Chime Communications in the UK, headed by Lord Sebastian Coe and trading as Essentially Group, providing legal and management services to rugby players internationally and acting for a range of All Blacks. “I’ve been interested in rugby since day one, so it’s great to be able to work in an area that I’m so passionate about. It’s not just a job,” he says. Rugby Union General Counsel Keith Binnie is the other lawyer holding a hallowed job in the rugby world, running a team of up to five lawyers handling everything from intellectual property issues (remember the “Ka Mate” haka issue?) to employment, contractual and regulatory work). 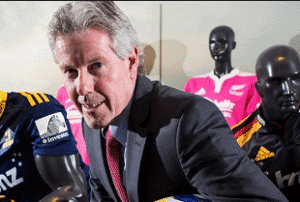 Protecting the “All Black” brand is the most important position he has; a position thrown into the limelight again this year with issues over the silver fern and the proposed New Zealand flag. With almost half the Union’s income coming from IP and branding revenues, the job is one that holds increasing challenges as the brand continues to grow and become ever-more attractive to those who would rip it off. A former employment and sports law specialist with Simpson Grierson, Binnie has been a decade with the NZRU and enjoys every moment of it: one of the unique law jobs in New Zealand.